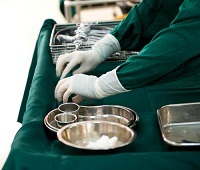 North Carolina Lawyers Weekly has a good article on a $2 million verdict against a vascular surgeon that I think is of interest to both medical malpractice attorneys and surgical malpractice victims. Plaintiff went to Pitt County Memorial Hospital for vascular surgery. She had suffered for years with vascular disease that left her with only a half a kidney that was not functioning very well. She was suffering pain from an aortic aneurysm. This is a bulge in a section of the aorta which is our main artery that carries oxygen from the heart to the rest of our body. It is a dangerous condition. In a nutshell, this woman was frail and having real health issues. So she goes in for an endovascular abdominal aortic aneurysm repair to fix this bulge in her aorta. The surgeon misplaced a surgical clip and left it inside of her. The result? She lost the one failing kidney she had. The last thing she needs is to be the victim of medical malpractice. But is exactly what she got. The vascular surgeon, Dr. Michael C. Stoner, claimed that during the surgery, Plaintiff experienced internal bleeding. Stoner used surgical clips, which are about the size of a paper staple, to seal off some bleeding vessels. Stoner misidentified where he placed two of the clips, however, putting them on her left ureter, the tube that carries urine from the kidneys—Plaintiff’s one functioning kidney—to the bladder. She is now on dialysis. What happened? In what I’m sure was an honest but tragic mistake, the surgeon left the surgical clips on her ureter. No one could figure out what her problem was for eight weeks. At this point, the doctors figured going back in to get the clips would be too great a risk for a woman who was already fighting for her health. So her doctor put in a permanent artificial tube to drain urine from her kidney into an external collection bag. Besides the awful inconvenience, this also increases the risk of kidney infection. From the time of her surgery to trial, this woman had been to the hospital 21 times for kidney infections. Just a tough situation. The jury saw this as a pretty simple case. After a two-and-a-half week trial, the jury needed just 75 minutes to award the plaintiff a $2 million verdict. What the Doctor Did Wrong? What the doctor did wrong in this case is classic malpractice. The unintended retention of foreign objects is a problem our lawyers see on a regular basis. The bottom line is that you have to count the clips. It is easy if the operation goes exactly as planned. Here, the patient had some unexpected bleeding and the doctor and the rest of the surgical team must have focused just on that and lost sight of the bigger picture. But you also shouldn’t be putting a clip on the ureter. I’m sure the doctor argued “abnormal anatomy” in defending the case. But don’t clip a structure unless you actually know what it is. Finally, the surgeon needs to check his work on the way out. If he had in this case, he would have seen that he inadvertently clipped the ureter. Doctors truly are making progress on these kinds of problems. A lot of great people have put a ton of time into trying to develop the right systems to help doctors. But for the system to work, you have to follow the system. Clearly, that was not done here.